What do you do if all you have is an idea? You are unlikely to get funded… so, how does one get started? Getting funding for a plain idea is going to be virtually impossible. 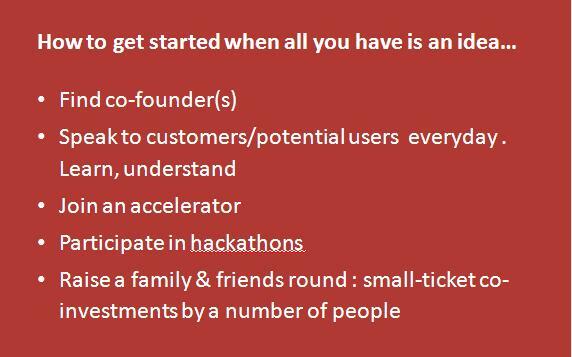 Ideas are a dime a dozen, but unless you are able to convert that idea into a product/service… even a MVP, and unless you are able to have a plan on how you plan to scale that up, investors are unlikely to be interested. Find some co-founders – 1 or 2 others who you can take along in your journey. Try selling your idea to potential co-founders. (Remember, an entrepreneur has to sell, sell, sell… not just to customers.. but he/she has to have the passion, conviction and the ability to sell the concept to others too.). When you look for potential co-founders, seek complementary skills… if you are not a techie find techie co-founders… someone who can build a MVP. Study the market – Speak to potential users every day… Understand what they will like about your product… See how you can further solidify your concept and make it even more powerful. Listen and be open to what potential users tell you about competition and WHY THEY WILL NOT USE YOUR PRODUCT. When customers tell you why they do not want a product, it gives you deep insights on what could go wrong in your business. If you are convinced that this is likely to be a good ‘business case’, then try and raise a bit of money through a friends & family round…. raise ONLY AS MUCH AS YOU NEED TO BUILD A MVP. E.g. if you need Rs.10 lacs… then perhaps you can raise it by getting Rs.50 thousand each from 20 people. Or Rs.25,000 each from 40 people. All the best. Plan well. Do well. Previous Previous post: How can an entrepreneur can master the art of execution? Next Next post: How do you do team appraisals in a startup?